Slotsino Casino will then reward you with a bonus (Welcome Bonus is for new players only). The terms and conditions of the bonuses vary between different casinos and might also change over time and between different countries, so it is important to compare the different offers and read the T&C for Slotsino Casino before signing up. 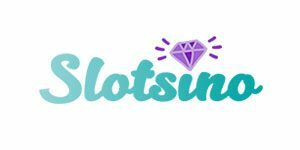 The Slotsino casino launched in 2018 under the Nektan umbrella, using a purple and cyan color scheme that, if we’re honest, really shouldn’t work nearly as good as it somehow does. The screen is dominated by a large welcome banner that scrolls through various bonus offer and drawing your attention to new titles. Above the banner, players can access support, log in, or register, while beneath it, players can sort through the various games offered by the casino, as well as keep scrolling down to find a sizeable collection of different types of games that you can find in Slotsino Casino. Gamblers looking to play the mobile version of the casino can do so on nearly every device, as there is no app download needed to enjoy this casino. Instead, Android and iOS users only need to access the website through their mobile browser, and they will be redirected to the mobile version of the casino. While the Log-in and Register buttons are slightly highlighted, it can be relatively easy to miss them at first due to the banner and the many slots downwards grabbing at player attention. Still, the most useful part of the user interface is the ability to sort by category of what kind of game you want to play – player favorites or all games, or you can be more specific to find progressive jackpot games, brand new games, casino games, instant win games, Slotsino exclusive titles and live dealer games. What we find rather curious is that you can’t sort to search by slots themselves – the closest you can get for that is to open all games, where you can find all slots – but by extent, every other category is also included there, which seems like a rather odd oversight for the casino to make. The casino is licensed by both the United Kingdom Gambling Commission and the Gibraltar Gambling Commission. Players can enjoy the casino in English, German, Italian, Norwegian, Finnish, as well as Australian and Canadian English. Player personal information is kept secure at all times, as the company has implemented the strictest processes to ensure that customer details are protected. Their policies follow the rules of the government of Gibraltar, the EU, and the UK. Slotsino Casino uses NextGen Gaming software for their instant play casinos, while the remainder of their games are from developers like NetEnt, Big Time Gaming, IGT, Microgaming, Aristocrat, ELK Studios, Evolution, Foxium, and a wide range of other developers who contribute to the casino’s vast library of games. 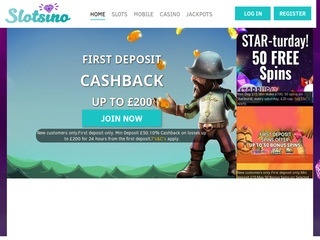 Slotsino offers around 250 games in total. While it’s difficult to really get the right number of slots, seeing as we’re unable to sort by just slots, but we believe the number of available slots sits around 200 somewhere. And really, being unable to select just slots makes sense from a certain point of view – you could potentially lure gamblers into playing another type of game. But seeing as gamblers are already given a choice of playing a demo version, we don’t think it was really a smart idea – considering another Nektan casino we reviewed also had this issue, we have to assume this was the intention. Let alone sorting by developers as we’ve seen in other casinos, or sorting by specific features or a certain reel setup. While the selection in Slotsino is rather nice, especially since it has NetEnt and Microgaming titles under the same roof, we have to admit, we were expecting an easier time to find what we’re looking for. The table games selection is quite nice, we have to admit. Most of it falls to various types of roulette and blackjack. You have well over fifteen different blackjack games, and over ten different roulette titles. On top of those, you have a few poker games, as well as a few baccarat titles, along with a wheel of fortune game. Players have a rather wide range of instant win casino games available. Supreme Football, Mayan Legends, Breaking Bad, Lil Lady Bingo, Cleopatra, Wheel of Fortune, Medusa, Lucky Falls and Spin Lotto are just a few titles that you can find in the Slotsino selection. A great number of titles you see in the live dealer you will also find in the table games section. The casino doesn’t really highlight them as live, apart from the fact it has humans standing over a table to indicate you play them with other players. The following payment providers allow for both deposits and withdrawals without a need for additional steps – Visa credit and debit cards, Neteller, Skrill, Paysafe card and Trustly. These aren’t the only providers – for example, Germans have access to Giropay and Sofort, Swedes have Zimpler, and British users can use Boku. But all of these services have to withdraw money using SEPA or bank transfers, and in the case of Boku, a 15% fee is deducted for mobile deposits. Gamblers have a minimum withdrawal of $40, except if it’s a final withdrawal for that account, while the maximum single transaction is 10,000 pounds – but you can have unlimited transactions. Gamblers can contact support via e-mail 24/7, or they can call or talk to support via live-chat from 08:00 to 00:00 GMT.